The crowds at Tokyo Disney Resort are nothing to shrug off. Knowing what the crowd levels are on the days you plan to visit help you decide what day(s) work best for you. 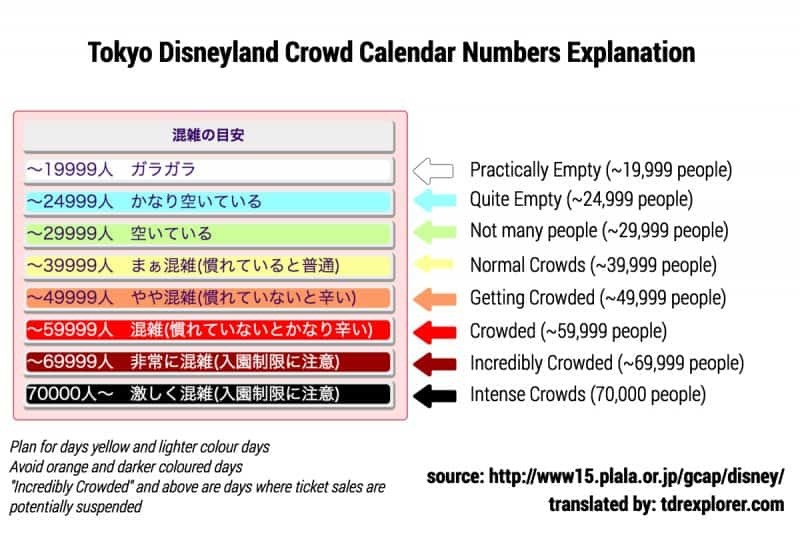 I’ll show you what the best and most accurate Tokyo Disneyland crowd calendar is and how it works (it’s only in Japanese). 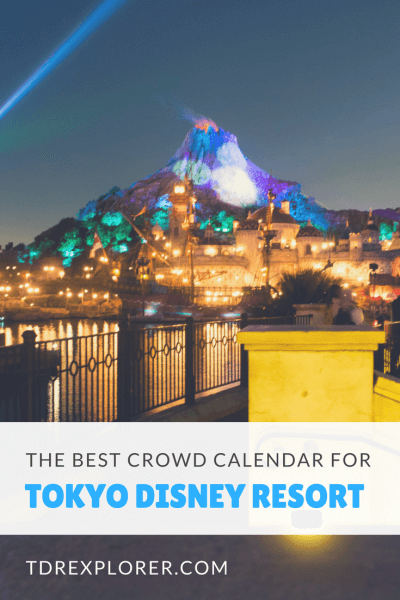 For a more in-depth look at the crowds (including a breakdown of every month at the Resort) in our comprehensive 200-page Tokyo Disney Resort Trip Planning E-Book. It’ll save you time and stress during your vacation at Tokyo Disneyland & Tokyo DisneySea. I recommend buying your Park tickets in advance to save yourself time. Read our guide on how to buy tickets for Tokyo Disney Resort and even save yourself some money. I recommend this crowd calendar which I find is the most accurate. You’ll notice it’s only in Japanese (ディズニーランド ディズニーシー 混雑予想カレンダー), if you use Google Translate, you’ll be able to get an idea of what it’s saying. I’ll explain the important points of the crowd calendar. The same website also offers a Universal Studios Japan Crowd Calendar. The explanation here will also apply to the important parts of that calendar too. I am not aware of a crowd calendar or forecast for Hong Kong Disneyland or Shanghai Disneyland. However, the general rule of thumb is to avoid the national holidays. Our planning guides for both Hong Kong Disneyland and Shanghai Disneyland cover this in detail. The most important part is colour-coded numbers. Those show how many people are predicted in the park. I have a detailed explanation of what the colours mean after this section. The hotel occupancy shows you prices and occupancy for the Disney Hotels, Official Hotels, Partner Hotels, and Good Neighbour Hotels. 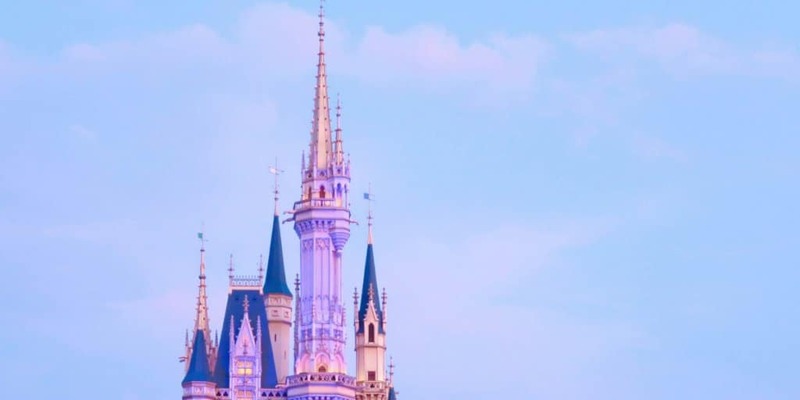 Read our Disney Hotel reviews for Tokyo Disney Resort for more information. What do these colour-coded numbers mean? The colours on the calendar show how many people are predicted in the park. The darker the colour the more crowded it’ll be. If it’s your first visit, plan for days that are yellow and lighter. Avoid the orange and darker coloured days. That means the crowds are high and potentially unpleasant. The dark red and black means the park may reach capacity. If you’ve been to the parks before, then orange is manageable since you’ll know the layout of the park. Always buy your Park Tickets for Tokyo Disney Resort ahead of time, this saves you so much time and is crucial if you’re visiting on busy days. If you hover over a day there is more information. You’ll see closures and what event is happening at the park. 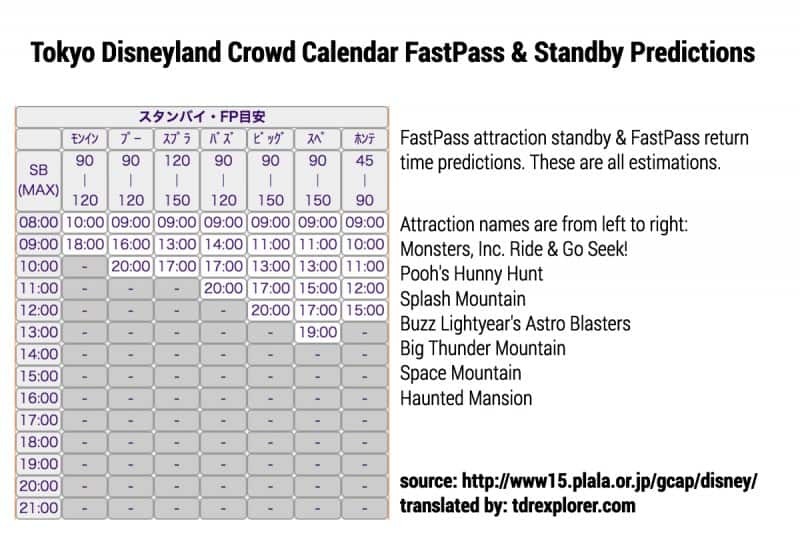 The important information is the FastPass attraction standby and FastPass return predictions. Numbers in the SB (MAX) row are the range of predicted wait times. Then the grid is what time they predict the return times are for the FastPasses are for a given hour (on the left side). For wait times in English, I recommend using the official website on your mobile device (or download the official app in Japanese only). Also, read our guides for attractions and FastPass strategies for both Tokyo Disneyland and Tokyo DisneySea. Crowds at Tokyo Disney Resort are high but as a general rule avoid the weekends and national holidays and visit Tuesday through Friday. The hotels are generally cheaper during this time too. What event(s) do you want to experience? Do my days fall on a weekend or holiday? The fact that you’re reading this blog means you’re more than prepared for the crowds. Choose the day(s) that work best for you, compare to the calendar, then adjust accordingly. The long lines at the start of the day are intimidating, but most days all those guests are absorbed into the park. 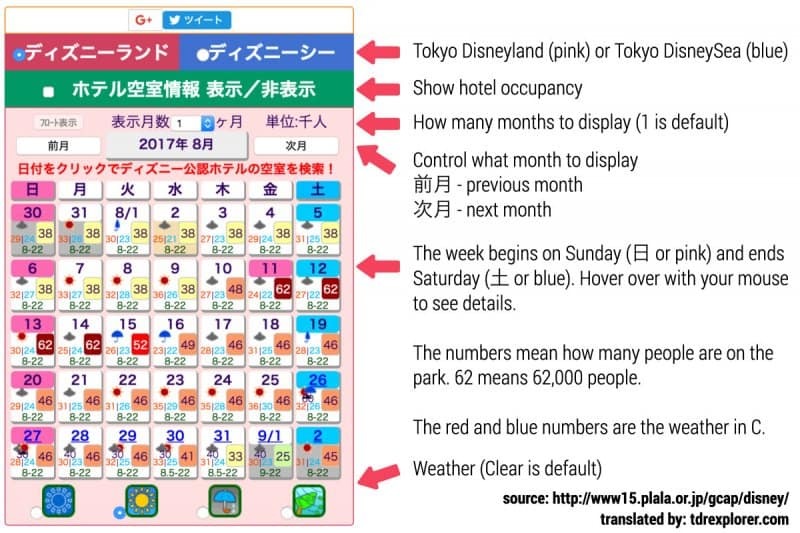 Now that you know how to read the Tokyo Disneyland crowd calendar, you can research on what days to visit Tokyo Disney Resort! Let me know in the comments how the calendar worked out for you. Thanks for sharing this…I just noticed this week that the English crowd forecast (TDR Navi) was gone! so much info on this crowd calendar! thanks for taking the time to explain! IMHO since HKDL is such a small park, I would just avoid the major China and HK national holidays. Thanks for the response…I‘ve been using your guide quite a bit to prepare. I think with how crowded TDR can get, I‘ve just been a bit nervous that HKDL would be the same way! Thanks! Will do! Trying to aim for a week day (or two) and definitely avoiding Chinese New Year! Nooo! I can’t believe they got rid of the other calendar – but thank goodness there’s Chris to the rescue! Your translation graphic helps so much. As always, thanks for the great info! Since I want to ride Journey to the Center of the Earth and Tower of Terror, I want to visit the resort before May 7. I’m arriving in Japan in the beginning of the terrifying Golden Week. 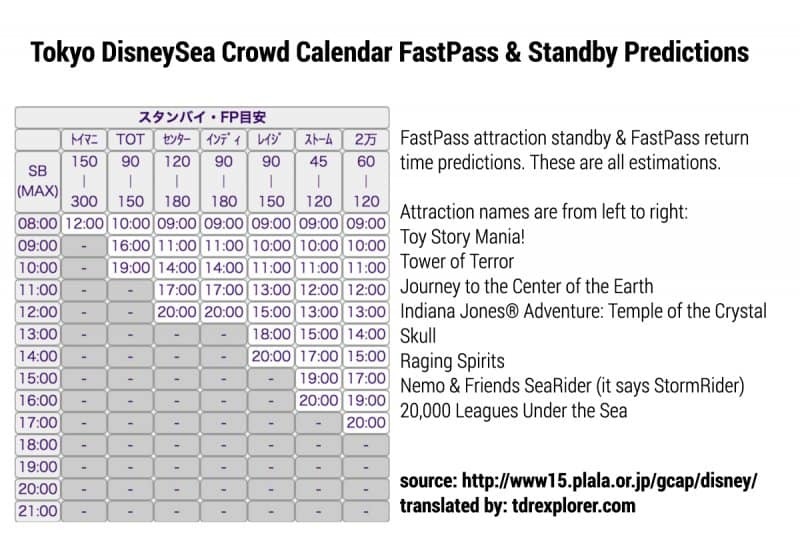 I was checking the amazing Crowd Calendar you linked here (http://www15.plala.or.jp/gcap/disney/) and it says that on May 1 and May 2 both parks will be “well crowded” (both days are yellow, yay!). Does that make any sense to you guys, since that would be right in the middle of the Golden Week 2018? I really need help with a decision here! When should I go? I arrive in Tokyo july 4th, I could either choose to go on a monday and tuesday so it is the least crowded or when should I go? Because I read that tanabata festivities start tuesday july 10 so I suppose that tuesday will be too crowded because of new shows and merch… Or is it safe to go that tuesday? Or is the sunday before that (the 8th) not crowded… What should I do? Do you know what the little weather symbols on each day represent – and how accurate they are ? Thank you for all your awesome articles. I have a question. We’d like to visit 6-7 nov as the crowd calender indicates that it will be uncrowded. I read in your other article that this is the transition period between halloween and christmas. Will we miss out if we don’t see the christmas events and all the decorations? Or is a less crowded park worth it? What do you recommend? Does your recommendation apply to both tokyo disneyland or disneysea, or is one more worthwhile during the christmas period?